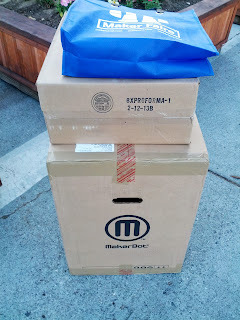 dbclunie: Part 1 - Maker Faire - I Purchased A Makerbot Replicator 2x! I Returned a Makerbot Replicator 2! Part 1 - Maker Faire - I Purchased A Makerbot Replicator 2x! I Returned a Makerbot Replicator 2! Hello Readers! You might be a bit confused by the title of this post, please let me explain my adventure with attempting to purchase a Makerbot Replicator 2x from Maker Faire 2013 in San Mateo. I've been wanting a 3d printer ever since I saw my first reprap in action and then the Makerbot Cupcake. I was hooked. However, I placed a few criteria that had to be met before I would purchase any of the 3d Printers. 3. Accurate. I'm still going to at some point pick up (or maybe make) my own stereo lithography printer which is the ultimate in fine detail when it comes to 3d printing, but from the cupcake to the Replicator there has pretty significant increased in the resolution between version of printers. I wanted at minimum 100 micron layer resolution. With those met I would purchase my first 3d printer. So when last year at Maker Faire in San Mateo, I noticed they were selling the Makerbot Replicator which seemed to meet all my requirements except the build area which is 11x6x6, I decided to wait until the dual extruder version came out. Then they announced they metal Replicator 2 and its twin with a dual extruder the 2x. I made decision that if the following year they had the 2x instock at Maker Faire that I would pick up the printer. I saved all year long, and when it came time to purchase my Maker Faire Tickets I did so with the thoughts of that weekend I would be printing 3d objects to my hearts content! Then the weekend arrived and we raced out to the convention center in San Mateo. I had a wonderful day taking pictures using a rig I constructed out of a light changing pole which you can find here on my photography blog, http://www.cluniephotography.com and Maker Faire was almost over, so we headed to the Maker Shed and low and behold I was told they had the Makerbot Replicator 2x in stock! WOOT! I discussed the pros and cons of the dual extruder vs the single extruder ultimaker, Hey Ultimaker if you would have had a dual extruder I would have gone with your machine as the prints looks ot me a bit "finer" than the makerbot. (this is something I think they're doing with their software, e.g., either better cutting objects up for a better print or their printers were really "dialed" in to show off the quality.) I then decided the ability to print out two materials was far more important, and purchase the Makerbot Replicator 2x! I paid $2799 and carted the box home. Much to my dismay when I started to unpack it at around 10pm I noticed a few oddities in the unpacking video and manual. I quickly looked and found only 1 extruder nozzel! I then looked at the front name plate, it said Makerbot Replicator 2! Noooooooooo! They had given me the wrong model!